Mike, Carol and Justin Marsh, along with Beth Connelly, spent a late-September evening fishing for spots on Kure Beach Pier. Spots are the guests of honor for fabulous fall feasts. 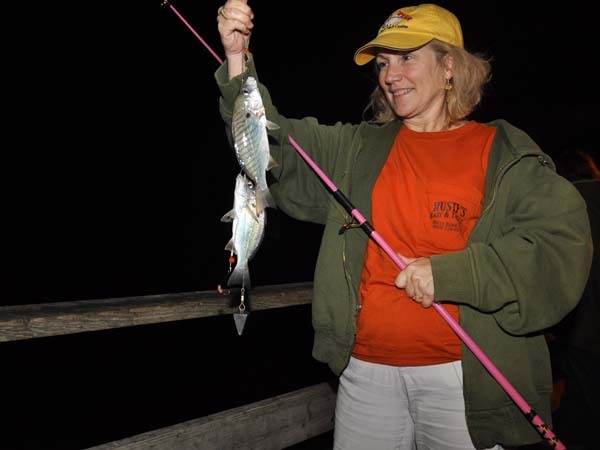 Carol Marsh adds flash to her spot fishing by using a Roddy Rod and Roddy Lites Reel that has flashing lights when a fish is reeled in. Justin Marsh drove four hours from Charlotte to Kure Beach Fishing Pier when he heard from his dad that the spots were running. 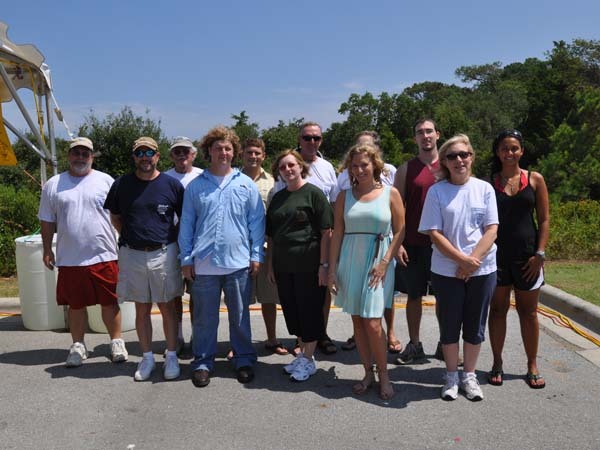 A dozen bloodworms accounted for more than 60 spots for a fish fry with his college buddies at the University of North Carolina at Charlotte - Lee College of Engineering. Capt. Jot Owens with a red drum caught at Wrightsville Beach. 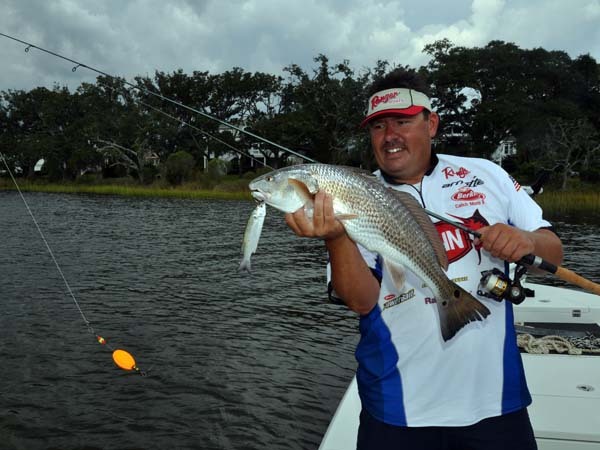 The fall run of redfish is in full swing, with anglers catching and releasing lots of fish within the slot-size and oversize reds. Live mullet, cut bait and topwater lures are working well. Mike Marsh recently spent a day with Captain Jot. Gotta Fly Guide Service and Cody Davis for some great red drum fishing on the backside of Topsail Beach. Mike Marsh recently joined Mike Taylor of Taylor Made Charters for some summer flounder fishing off Bogue Inlet. The guys had a very successfull trip, catching around 100 flounder for the day. Take a look at this short video of one of their catches. 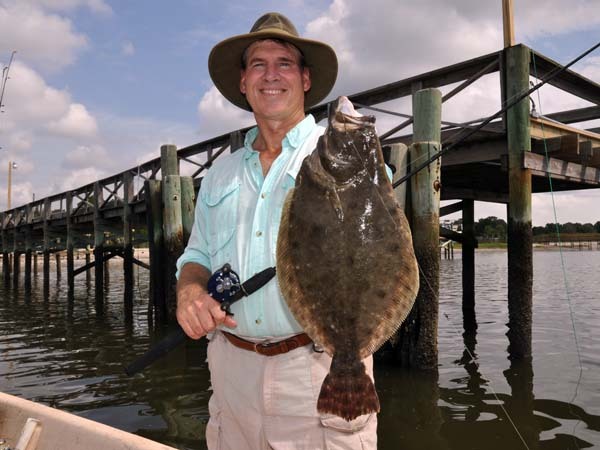 The fall flounder bite is beginning. This southern flounder weighed 4 pounds, 5 ounces and struck a live mullet fished beneath a dock. Not a citation, but still a nice fish. Big flounder are around, but have been relatively scarce this season. September should produce better inshore flounder fishing. The progression of shark invasions continues. 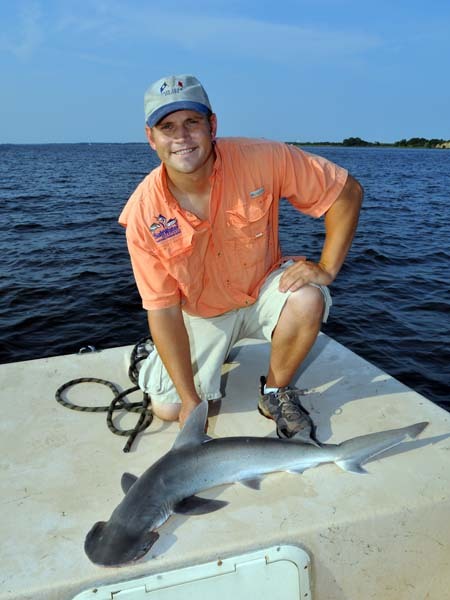 Earlier this summer, smooth dogfish ate all of our flounder baits, followed by blacktip sharks. Now, the bonnethead sharks seem to be everywhere. Fishing's great, if you like catching sharks. Justin Marsh landed this nice 4-footer.